Support us when you shop at the Co-op - Halow Project - Co-op Local Community Fund. Guildford Co-op shoppers were surprised last week to be served by Hector the Bear, the halow project’s charity mascot. 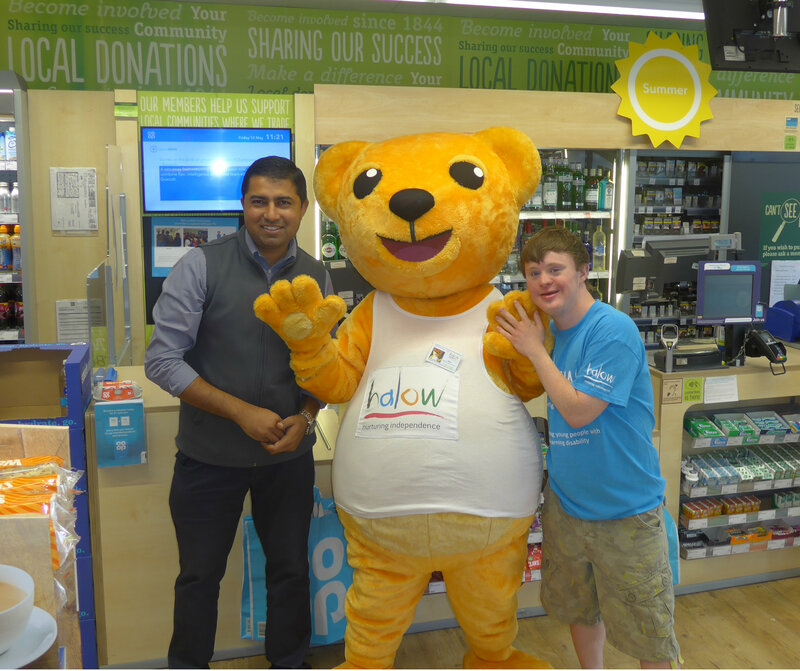 Hector enjoyed visiting the Guildford Co-op, learning how to use the till and stacking the shelves to celebrate halow’s success in being chosen to be part of the Co-op Local Community Fund. The money raised will go towards supporting young people aged 16-35 with a learning disability to take part in halow’s Social Activities programme. The social activities programme provides meaningful activities which are designed to give young people the chance to enjoy an active social life, make new friends and give them the confidence to find further educational and employment training, live independently and become part of their community. With the support of local Co-op customers and the The Co-op Community Fund, the halow project will receive 1% on everything that you spend on Co-op branded goods and services purchased by Co-op members as well as every 5p carrier bag charge from the local Guildford branches. Pease help the halow project by joining as a Co-op member and choosing halow as your allocated charity.